Budapest is the capital, largest city, and cultural center of Hungary, having about one-fifth of the country's population. 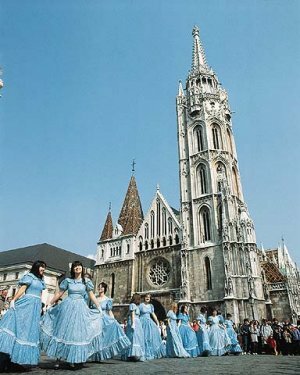 Situated on both banks of the Danube river, 217 km (135 miles) southeast of Vienna, Austria, it embraces three older cities: Obuda, Buda, and Pest. The city has a population of about 2 million people, it is flanked on the west by hills and on the east by the Hungarian Plain. The origins of Budapest's three separate urban districts are quite distinct. Obuda lay on the west bank of the Danube, close to the Roman frontier town of Aquincum. Buda lay to the west on a steep hill, Castle Hill, and in the Middle Ages it became a seat of the Hungarian kings. Pest spread out along the flat east bank of the Danube and became a commercial and industrial city. The people of Budapest are mainly Hungarian. The population includes Germans as well, however, and South Slavs remain from the period of the Ottoman invasion of southeastern Europe. In Buda are the remains of the former royal palace, the historic 13th-century Cathedral of St. Matthias, 18th-century government buildings, and the former town houses of Hungarian noblemen. The architecture of Pest is mainly 19th century, although within the curving line of the boulevards, which follow early defenses, are recent industrial and residential quarters. Pest contains the 19th-century neo-Gothic parliament building. Budapest is also the chief educational and cultural center of the country and is noteworthy for its museums and art collections like the National Museum and Budapest Museum of Fine Arts. 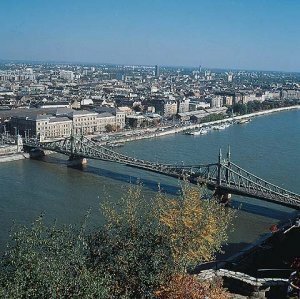 Some of the most noteworthy sights of Budapest are Matthias Cathedral, Fisherman´s Bastion, Heroes Square and Margaret Island.